Set amongst a lush garden of exotic plants and flowers and the soft chirping of birds, Pension Michel houses seven standard rooms each with its own spacious terrace distinctly painted in dark green and yellow to blend with surroundings and where you can enjoy your pre-dinner drink and snacks and reminisce the day’s activities. Additionally, we have one large family room that is ideal for a family of 4 (2 adults and 2 children). All the rooms are conveniently fitted with double bed, en-suite bathroom, wardrobe, mini-fridge, the choice between air-conditioning and ceiling fan and indoor and outdoor shower. 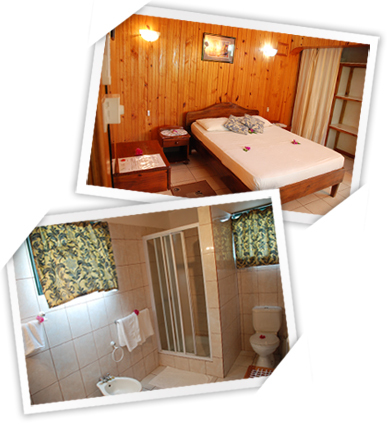 For your convenience, the rooms can be booked on bed & breakfast and/or half-board basis.